Beijing will not sit by and see several countries throwing the South China Sea into chaos, the head of China's delegation to a high-profile intergovernmental security forum said on Sunday. 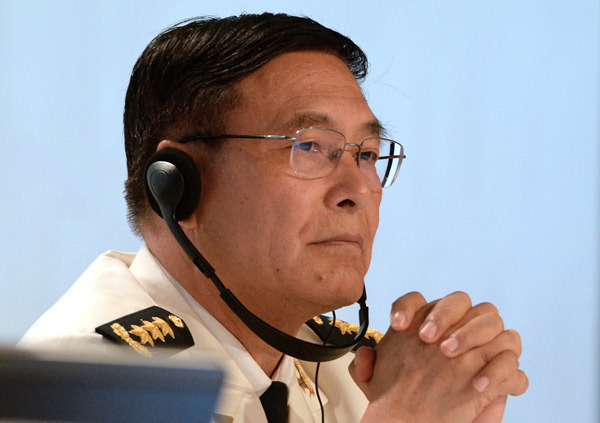 Admiral Sun Jianguo, speaking in a raised voice, made the comments at a plenary session of the annual Shangri-La Dialogue in Singapore, attended by defense chiefs and experts from around the world. But Sun, deputy chief of the Joint Staff Department at the Central Military Commission, spoke in a lower voice to say he believes that other parties involved have "wisdom and patience" — like China — in charting "a path of peaceful negotiation". Elaborating on this, Sun said, "Countries that are not involved are not expected to act out of selfish interests and deliberately damage this path." The different tones used by Sun reflect China's attitudes toward players in the South China Sea issue, where tensions have increased after recent claims by the United States over "freedom of navigation" and an arbitration case brought by Manila against Beijing. "The world today is undergoing historic changes as never before and the Asia-Pacific countries share good times and bad times together," Sun said in his speech. During his stay in Singapore from Friday to Sunday, Sun held 17 bilateral meetings on the sidelines with senior defense officials, including seven from the 10-member Association of Southeast Asian Nations. It was the second year that he had represented China at the dialogue.